I’m addicted to your weekly window contest. It is challenging, fun, and a great distraction. But there might be more practical uses for the skills involved in solving the contest. Recently, several bloggers have been using a photo posted on Twitter to figure out where the BUK missile system that Ukraine’s Russian separatist rebels had misplaced has been traveling. KoreaDefense.com has this post explaining how it and other bloggers found the location. Earth has two hemispheres, and this view is clearly on one of them. Seriously, the EU license plates (and I should know better than to get fixated on license plates) and French vehicles had me checking every remaining Western Hemisphere colonial enclave, before finally deciding that those white buildings = Portugal. So Lisbon, and it’s wrong. When it turns out to be Morocco I’mma throw something. Hoping proximity counts on this one. I cannot pinpoint the city, but it is very reminiscent of Playa del Carmen in Quintana Roo, Mexico. Quito, Ecuador. It looks like the old city, perhaps on or near Guayaquil. No idea, but it looks like you could eat off that street; it’s so clean! Had to be in the south of France somewhere. I looked up the last few stages of the Tour de France and decided this must be Maubourguet, starting point for stage 19. But it could easily have been somewhere else in the south: Nice, or Cap d’Antibes, or something like that. Beautiful light. This is my very first entry for the VFYW contest. I saw English words, European traffic signs, and Mediterranean style roofing slate. I googled “English speaking Mediterranean countries” and came up with Gozo, Malta. Then I got lost in all the gorgeous photos of the land and art and couldn’t be bothered to track down where the photo was taken. I randomly chose Victoria because it’s in the center of the island and “Victoria Gozo Malta” sounds goofy when you say it out loud. I don’t know if I’m even close, but it was worth it for the photo tour alone. (1) Googled “Tourneo” (back of the white car/van): said it’s a Ford model used mainly in Europe. (2) Looked up the formats of European license plates by country; the only match was Spain. (3) Googled “Spain red tiled roofs” and found lots of stuff about the White Towns of Andalusia. From there I was stuck. The sign in the foreground appears to be for a restaurant. It’s hard to tell what the second row of the sign says: begins with a C or G, and the third letter is probably Ñ. I went through an enormous list of restaurants in Andalusia on TripAdvisor, found some possibilities, but came up empty. EU license plates, looks to be on or near the Mediterranean, most likely in a country where the word for “restaurant” starts with “R-E-S-T”, which is basically all of them except Italy and Malta. The two readable license plates are in the four digit, three numeral format which is apparently unique to Spain. I recently spent two lovely weeks in Barcelona, and only really ventured briefly out of the city to Girona and Figueres. This isn’t Barcelona (the sidewalks are too narrow, the streets too wide) but it could be one of the other two, or any of dozens of other small cities in Spain. But I’m actually inclined to say that this isn’t likely anywhere in Catalonia, because there are no Catalan flags to be seen, and I saw them EVERYWHERE when I was there. Is this one of the famed “White Towns” of Andalusia? It sure looks like it. But which one? The fact that we have a fairly modern street (asphalt, not cobblestones, wide enough to park cars on both sides, and in a fairly grid-like configuration) may narrow it down a bit to the larger towns. And the convergence of opposing one-ways onto another street seems a pretty unusual configuration. That should be easy to spot … but it isn’t. I’m liking Ubrique, for its size and layout, and the surrounding landscape looks right. But I can’t quite seem to nail this one down. Algodonales looks exactly right for the surrounding landscape, but again, I can’t seem to find the exact spot. Ditto Grazalema. And Prado del Rey. So, I’m going to go with my gut and stick with Ubrique. No matter: browsing the White Towns on Street View was a great deal more enjoyable than looking at Sports Authorities in the Northeast! And I really need to get back to Spain. This one is driving me crazy! The truck in the foreground has Spanish plates but all the signs are in English. This makes me think the most obvious place would be Gibraltar. After rooting around in Google maps I found similar looking road signs, and the architecture seems like a fit, but I can’t for the life of me find a road that matches the one pictured. So I’m just going to have to say Gibraltar somewhere off of Main street. Although I’m sure I’m off by miles and that this is some obvious yet obscure region that several Dishheads will have vacationed. Tuesday can’t come fast enough! Since today is national dance day in the US and I just this afternoon read that Father “Pepe” Jose Planas Moreno dances the sevillanas with his parishioners at his church in Campanilla in the Malaga district of Spain (seen below) – I’m going with that town. I wish I had time to delve more deeply into the search but will be seriously happy with myself if I’m this close to correct! This week’s contest is massively frustrating, I’m haunted that I am missing some clear clue as to the location. For a while I was stuck on the French Riviera, based on the white houses, red roofs, and appearance of the stop sign. But I eventually started investigating the licenses plates and found that 4 digit/3 letter combination is unique to Spain. But I couldn’t find anything else in the image to focus my search. After looking at Pamplona (given the recent running of the bulls) and not finding any likely hits, I went further afield. It appears that the Canary Islands are rife with one-way streets, occasionally have the word stop printed along crosswalks, has a predilection for green shutters, and has a terrain that may match the background. 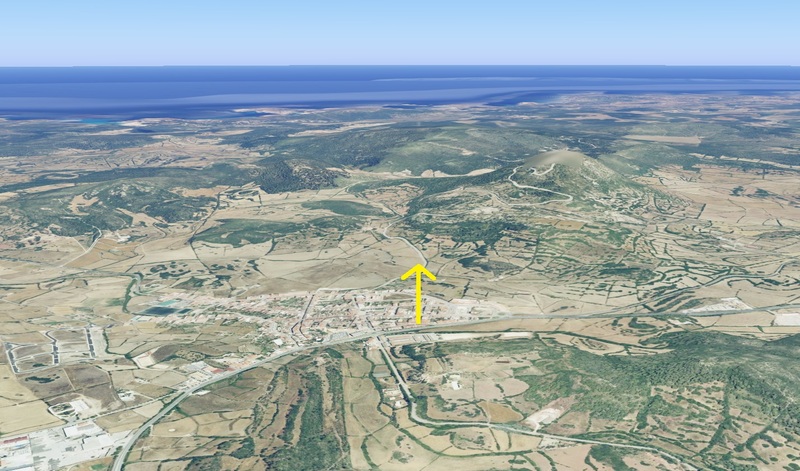 But zooming around the islands in maps and street view hasn’t helped in isolating the location. For some reason, I still feel strongly that the Canary Islands are it, so I’m guessing Santa Cruz de Tenerife, prepared to find out that I missed some obvious hint and that the location is actually on the mainland in Spain. I’m sure that there are contributors with hi-res screens who can read a phone number on what looks like a restaurant menu posted on the left, but all I have to go on is a Citroen sedan with a Euro-style plate. Having Googled the number/letter sequence I’ve narrowed it down to Spain. And with the Mediterranean look of the buildings I will make the wildly general guess of Ibiza, Spain. Last week’s Sherlock Holmes here. I’m going to play the game like I play GeoGuessr. In GeoGuessr you can, if you want, travel in the scene until you get to a place where there are clues to where the picture was taken. Instead, I usually try to go solely on gut, and whatever clues are in that frame and only in that frame. With this VFYWC, I could spend hours googling “red tile roof” or try to find out what countries the Ford Tourneo is sold in. (If that’s even the right model of the mini-van in lower right of this week’s view.) I could invest the rest of this lovely Saturday searching for that white “R” on a red background to see if I can figure out if it is associated with a specific location. Instead, I will once again go with my gut and say Mallorca, Spain. The cars look European – where else do they still sell Citroens, after all? The license plates are from the EU, I think. Plus, the scene has sort of an island feel to me. The red tile roofs feel Spanish. So, Mallorca. I realize I’ll never win the book this way. But life is filled with disappointments. The house is a cheap-looking Spanish colonial with a Mediterranean color scheme. It appears to be an old farm (olives or wine ?) with several buildings that has been converted to apartments. I deduce that from the exterior wall connected them and the lack of a balcony on the building on the right. Also, there is an old stone horse trough that’s being used as a planter, but possible it was previously used for actual horses or as a water reservoir to clean the olives or grapes. So based on the horse trough I am narrowing my search to Spain, Portugal, or nearby islands, where horses were common. It looks like water in the background, so I am guessing that’s the ocean. I can’t imagine unpaved rundown apartments being that close to the ocean – at least not in mainland Spain or Portugal. So how about Mallorca, or Minorca or one of the Balearic Islands? Possibly, but the color scheme doesn’t fit, and the those islands have mostly hipped roofs or higher pitched roofs and brighter colors. 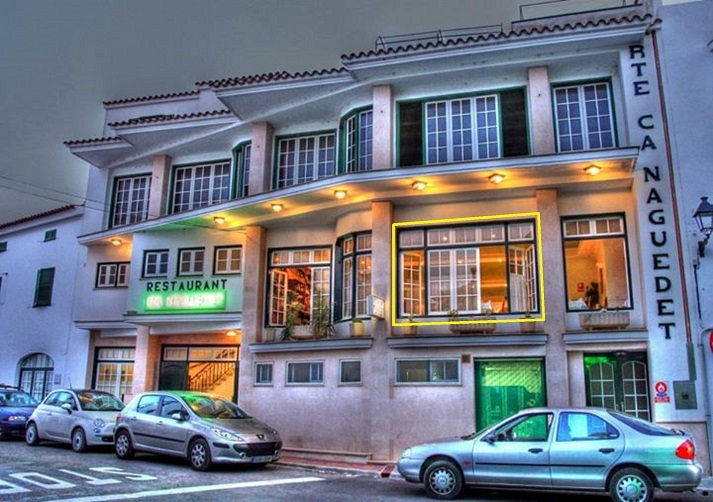 However, Madeira does have some dull colored unpaved properties close to the water with hilly populated areas visible from a window – specifically Funchal, Madeira, Portugal. Wish I could make out the three numbers above the exterior doorway, but I only participate by iPhone with no access to photo enhancement. So my guess is Funchal. 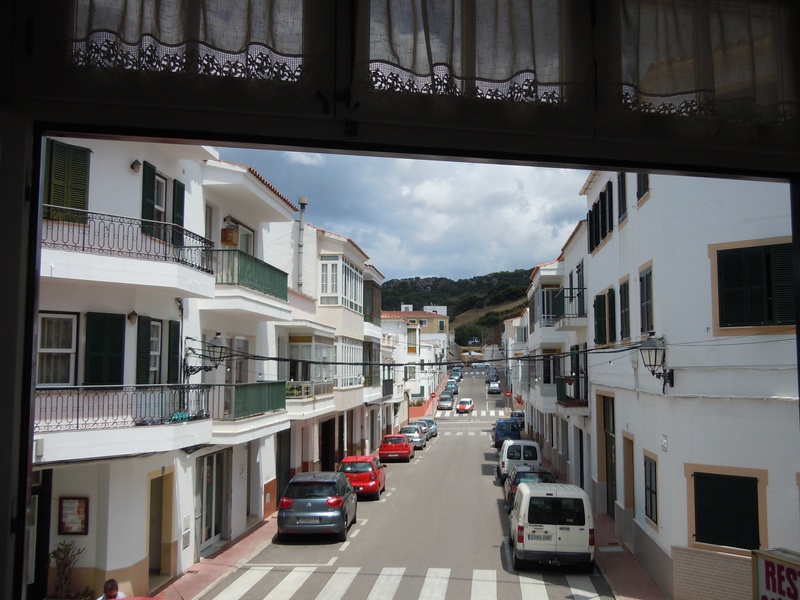 This week’s view comes from the town of Es Mercadal on the island of Minorca, Spain. More precisely, the picture was taken from the front dining-room windows of the Restaurante Ca N’Aguadete and looks east northeast along a heading of 71.92 degrees towards El Toro, Minorca’s highest point. Well, looks like for the second time in around a month living in Spain is having its advantages for this contest. The plates are Spanish. An eagle-eyed reader might be able to get the “E” as the country code on the plate, but the 1234 BCD format is how things have been done here since around 2000. This leads to the key clue to be found on the red Seat Ibiza. Prior to the current format there was a province code followed by 4 numbers and one or two letters. The Ibiza, quite aptly, has the code IB for “Islas Baleares” meaning we are looking at Menorca, Mallorca, Ibiza, or Formentera. I have been driving myself crazy trying to figure out what town it could be, though. There is terrain, but not big enough mountains to be Western Mallorca. A particular style and abutting one way streets. Perhaps not even Balearic islands at all and the number plate is a red herring. Either way, I just don’t have it this week, but I will go with my gut of the towns I looked at and say it’s Ferries, Menorca. Wish I could get an exact window, but not this time. I’m thrilled you chose the photo, my first submission. It’s from the second floor (European “1st”) of Restaurant Ca N’Aguedet, Carrer Lepanto 30, Es Mercadal. We shot the image from just to the right of the perpendicular “restaurant” sign that’s just visible in the picture. We were in Menorca to celebrate a significant birthday of mine and because my husband had lived in the capital, Mahon, as a child. The restaurant, where we ate on a friend’s recommendation, is outstanding; its chef is dedicated to reviving and preserving traditional dishes of the island. And for our newer players, don’t worry – the views are rarely this hard. Until Saturday! Inspired in part by the VFYW Contest, Wonkblog started running a contest of sorts whereby we present a map or other visual sans labels and ask readers to identify the data behind it. This week’s installment is here; here is last week‘s and the answer post. Thought you might enjoy. Their latest contest closed yesterday and a new one will be up this Friday at noon. Check it out, VFYW nerds. Previous VFYWC inspiration felt by the NYT and CNN.